By tricking our conscious minds into allowing unconscious thoughts and processes onto the page, we can be surprised by where our pen takes us, by a voice we hadn’t known existed. In fact all kinds of enlightening new connections and insights can reveal themselves when we’re writing – particularly in a group setting. Many of the writing exercises that make up Write your Mind workshops are designed to promote self-exploration in a way that stirs creativity and often feels much like playing, yet can enable participants to make personal discoveries about themselves and their inner worlds of which they were previously unaware. ‘What I gained from Jo’s workshop day was quite remarkable. 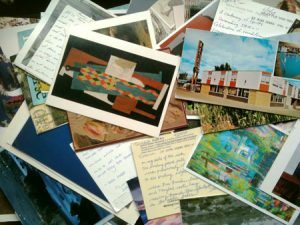 One of the activities involved looking at a mass of randomly chosen postcards, then to hand to your neighbour the postcard you thought they would like the most. I was handed a postcard which triggered a story in the deepest part of my mind – about motherhood – which I wrote out. I then realised I had been writing about myself. The experience gave me the most unexpected insight, quite astonishing, and fundamentally changed my view of a major life event – a traumatic relationship break-up: just one postcard’.